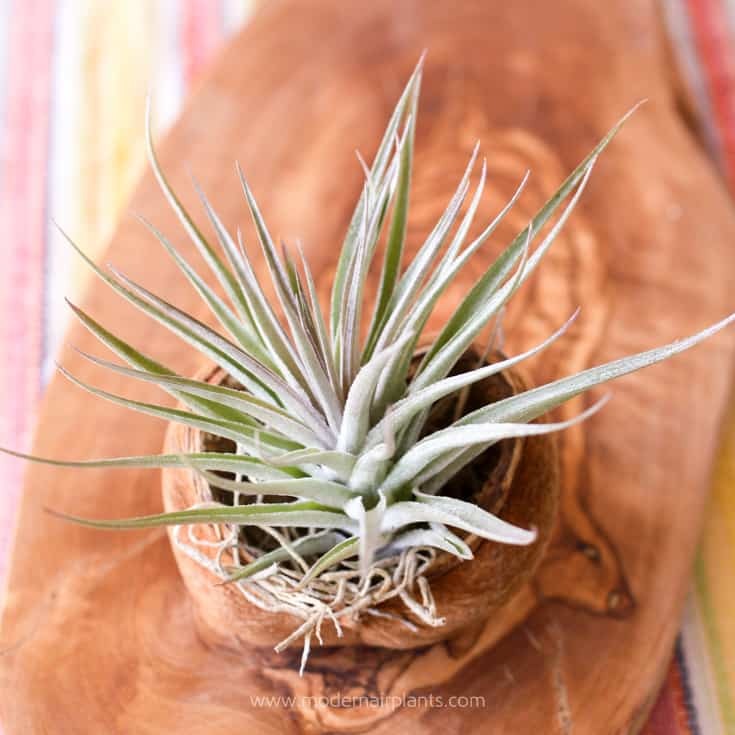 If you like the idea of using natural elements to display your air plants, read on. 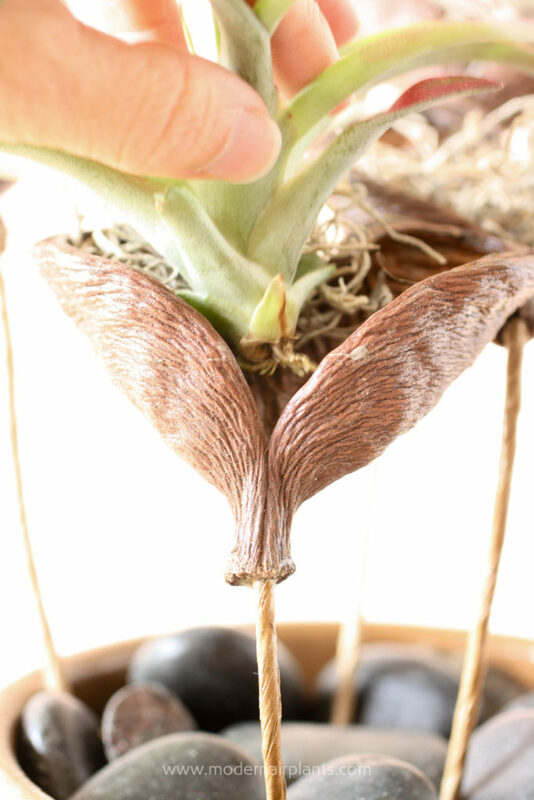 In this post I’m featuring 4 different seed pods, badum nut pods, bells cups, monkey pods and velvet pods to inspire you to create your own designs. Three of the four pods are stemmed, which means that a steam has been added. 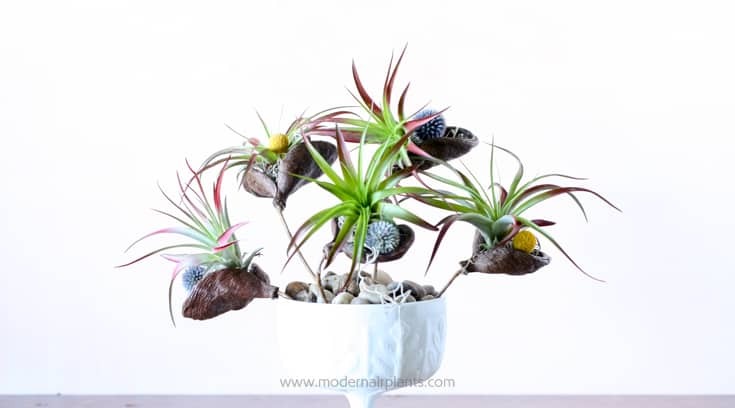 If you prefer displaying your air plants without the stem, notify the seller that you would like your pods without stems. 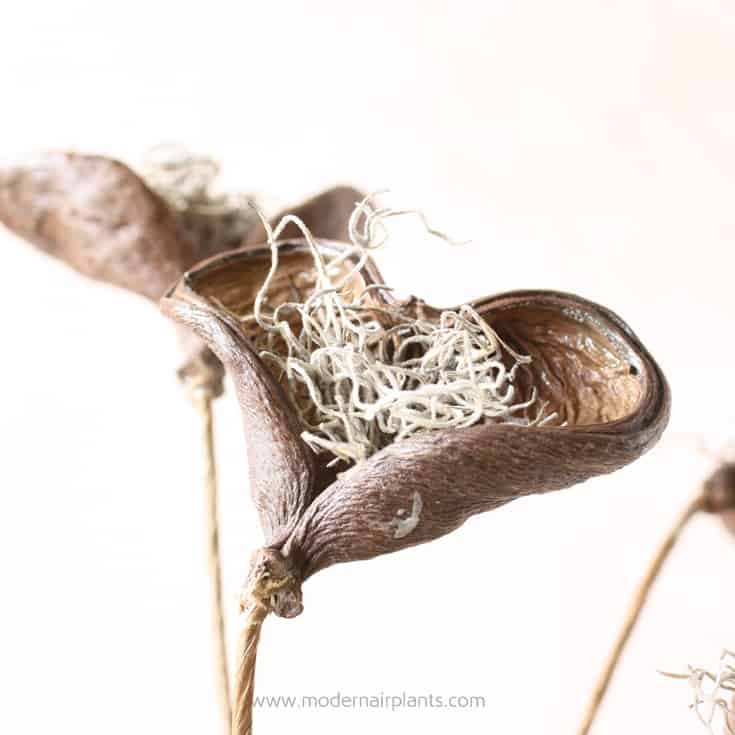 Seed pods of your choice: badum nut pods, bell cups, monkey pods, velvet pods. Dried Flowers (optional). Finishing off the displays with a dried amaranth, Billy balls, and globe thistles add a nice pop of color without overwhelming the design. Floral glue (optional). 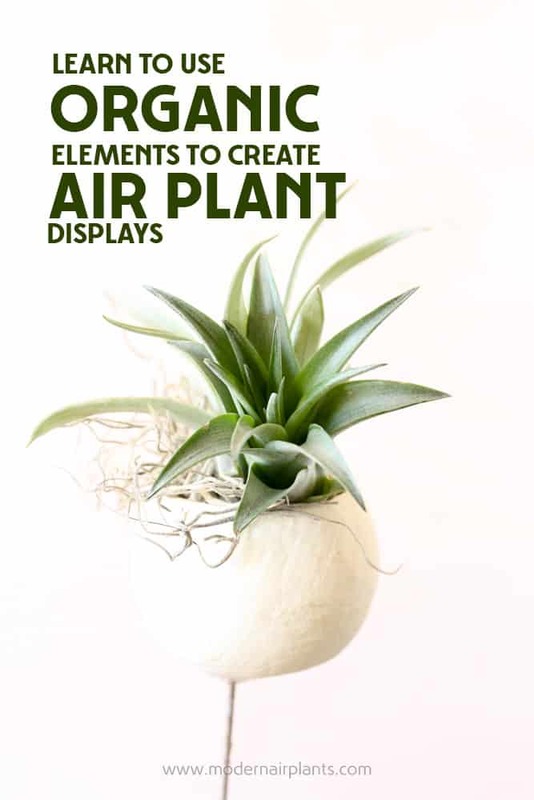 I did not use glue in these designs as I want to be able to remove the air plants from their displays to water them. 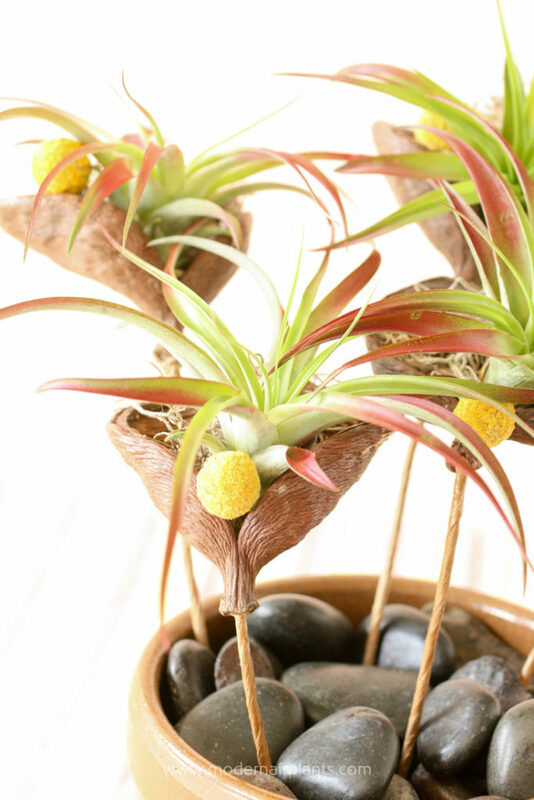 However, if you would like your display to be more secure, use glue to affix the air plant to the pod. 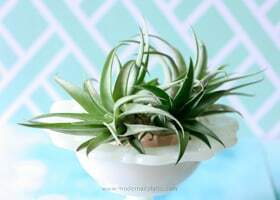 In this case, use a spray bottle to mist the air plants. Misting will prolong the life of the plants but is not the ideal watering method for long-term care. STEP 1: Put the flower frog in the bottom of the vase. Trim the wire stems and stick into the frog. This will take some fiddling to get the stems just the way you want them. Cover the frog with the pebbles . 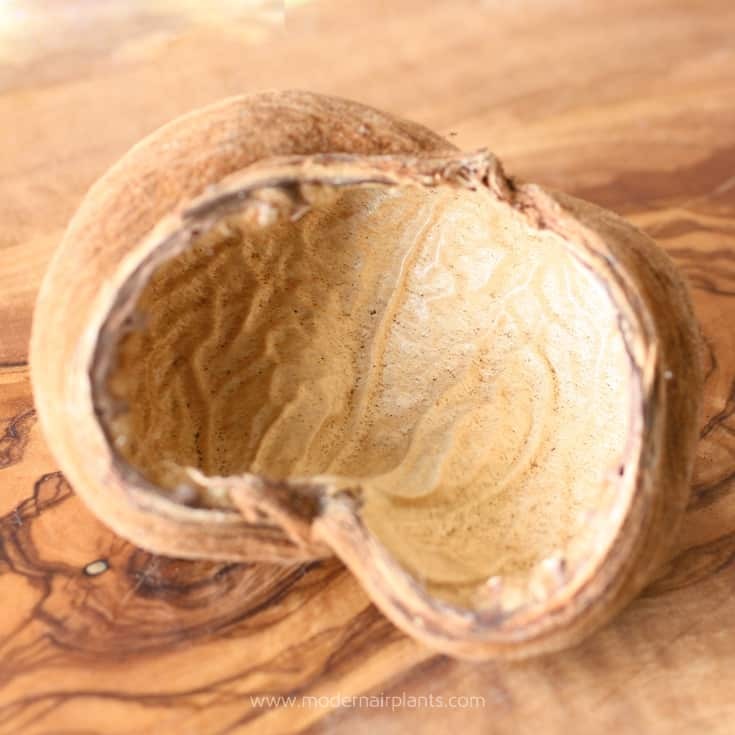 TIP: When poking in the pod stems, aim for a roughly triangular shape. 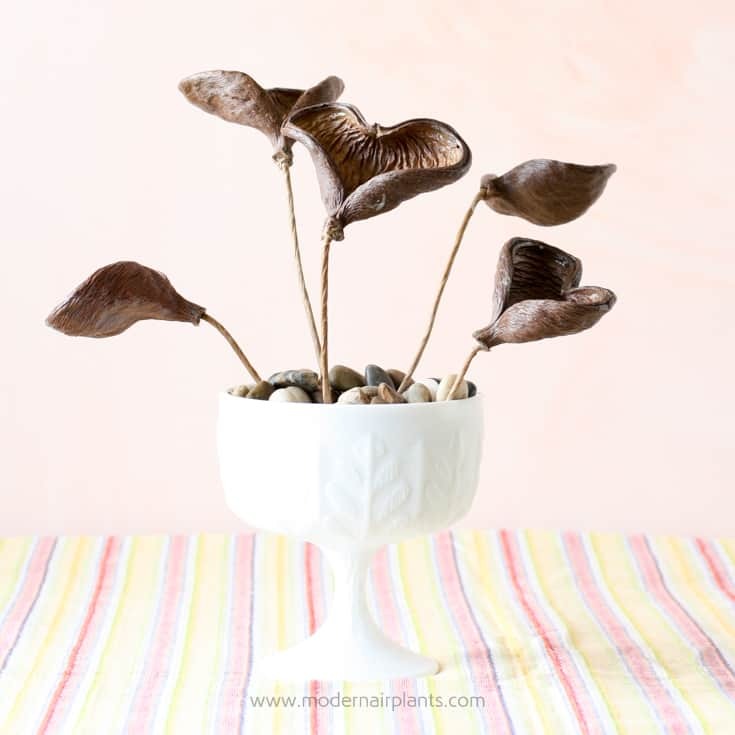 TIP: Cut the stems so that they are different lengths. 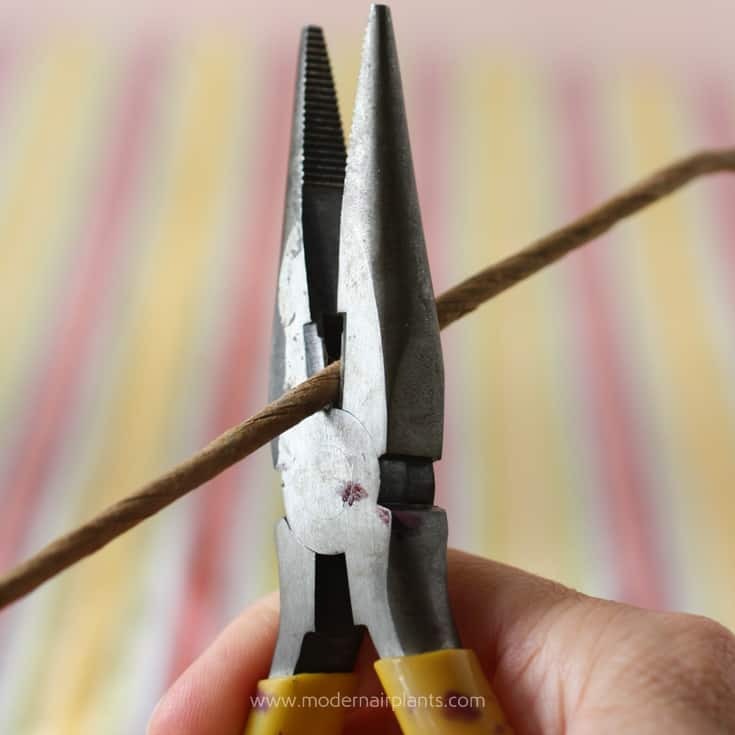 Depending on the thickness of the wire stems, you may really have to squeeze tightly to cut the wires. 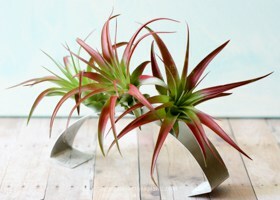 STEP 2: Bend back the pod so that the cup is facing upward and will hold the air plant without spilling it. 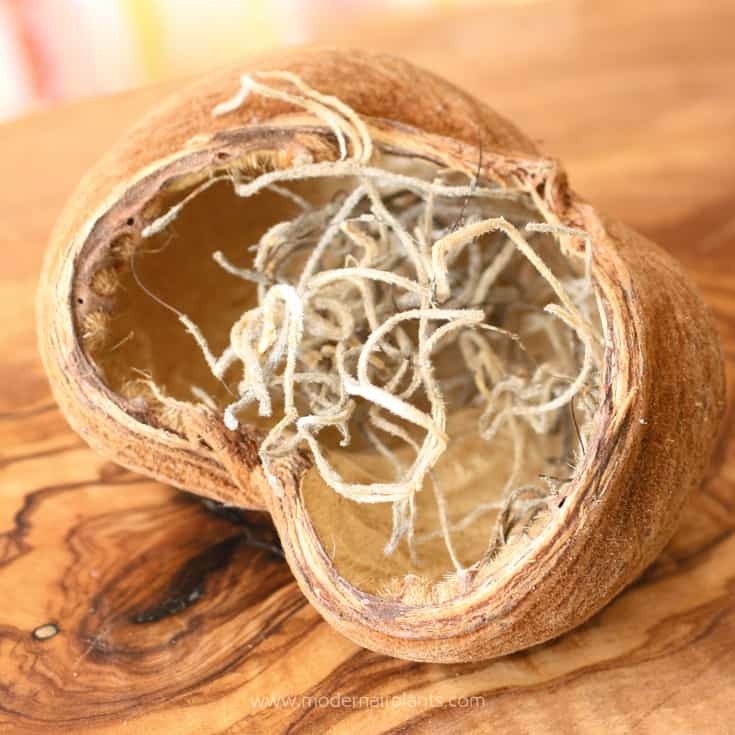 STEP 3: Add just a bit of dried Spanish moss to the pod. 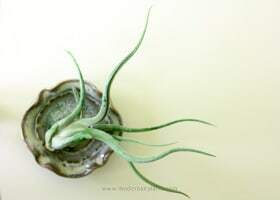 STEP 4: Set the air plant in the bottom of the cup so it looks like it is growing up out of the pod. 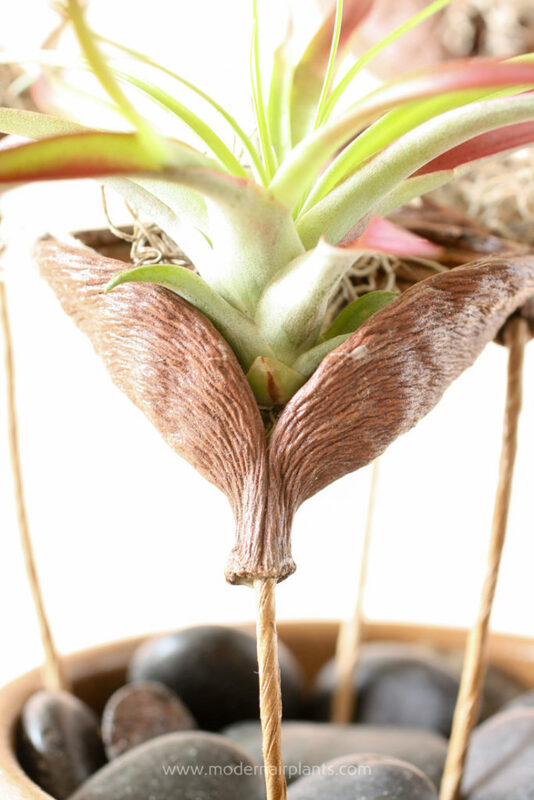 This Tillandsia red abdita sits securely in the badum nut pod. STEP 5: Finish the design by adding some dried flowers Pictured here are red abdita air plants, sitting atop Spanish moss accented with dried Billy balls displayed in badum nut pods. 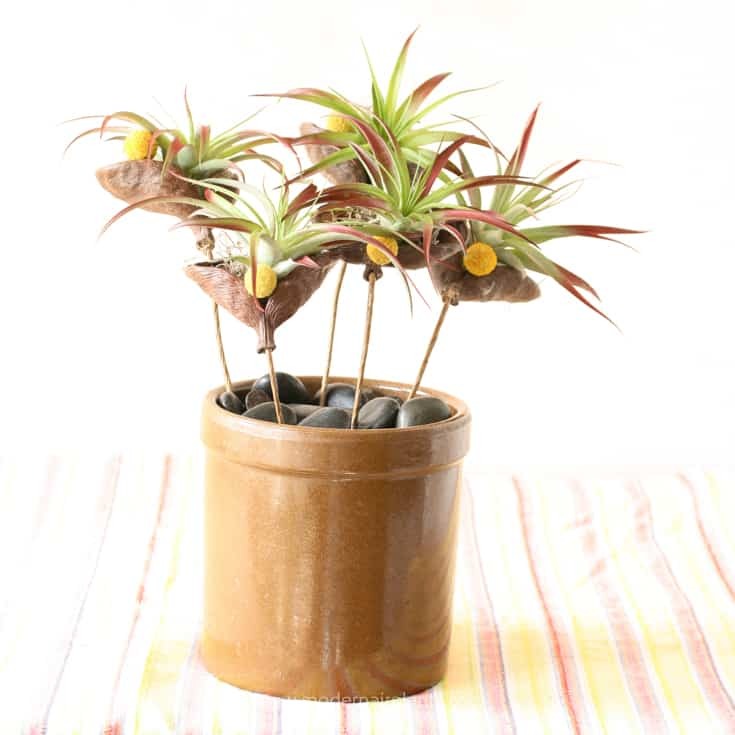 Badam nut pods show off red abditas and billy balls in a chocolate colored pot. Here’s a similar arrangement only with a white pedestal-style vase. Globe thistles and billy balls have been added to the mix. 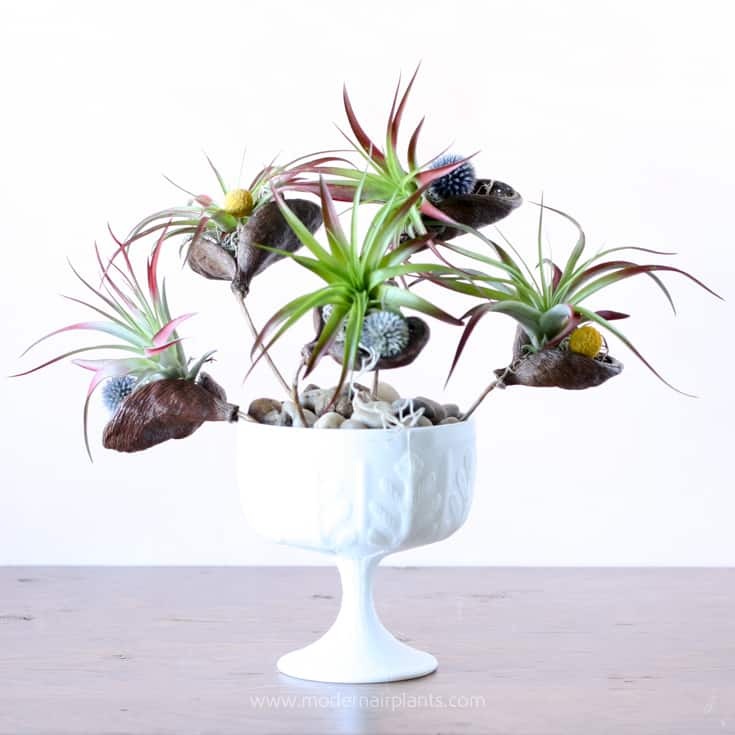 This bleached bell cup is a natural choice for displaying these Tillandsia harrisii, with a bit of Spanish moss peeking over the side. 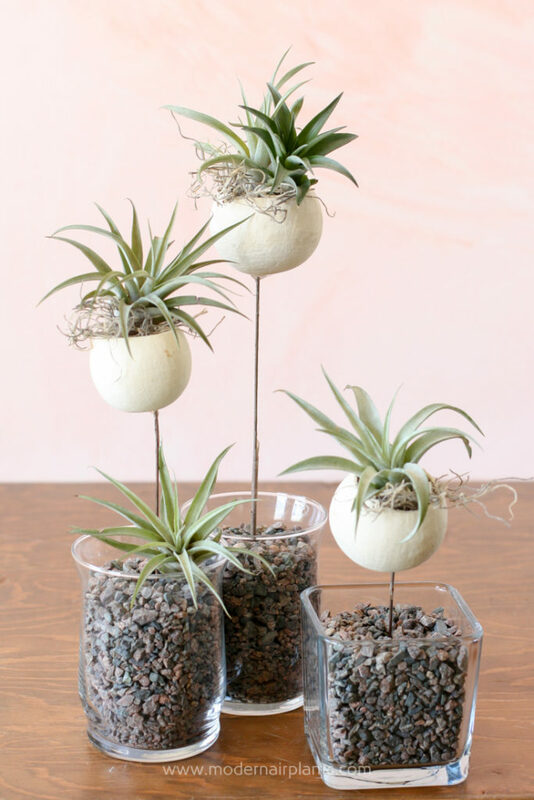 Rather than a single vase, a trio of glass vases filled with crushed granite creates a modern air plant arrangement. 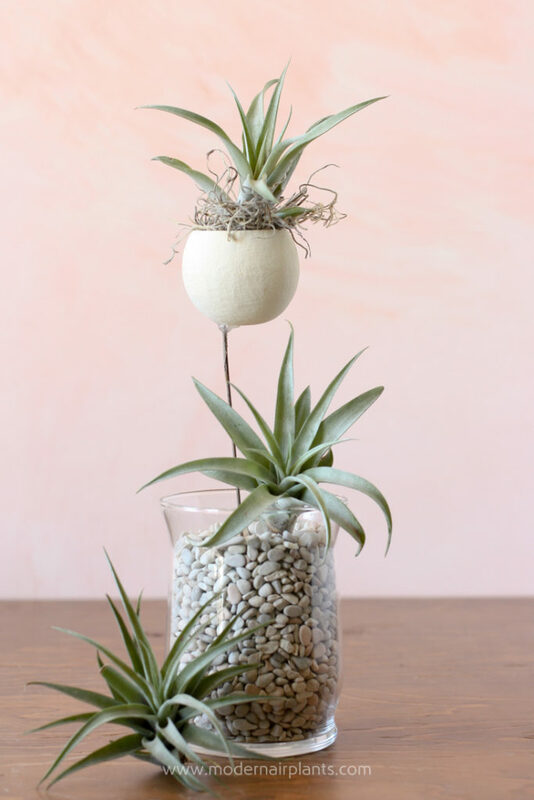 A single vase filled with pastel pebbles and adorned with three Tillandsia harrisii is an elegant stand-alone display. An alternative to pebbles is to layer sand. This display looks chic from top to bottom. The lush Tillandsia green abdita contrasts nicely against the rough texture of the monkey pod. 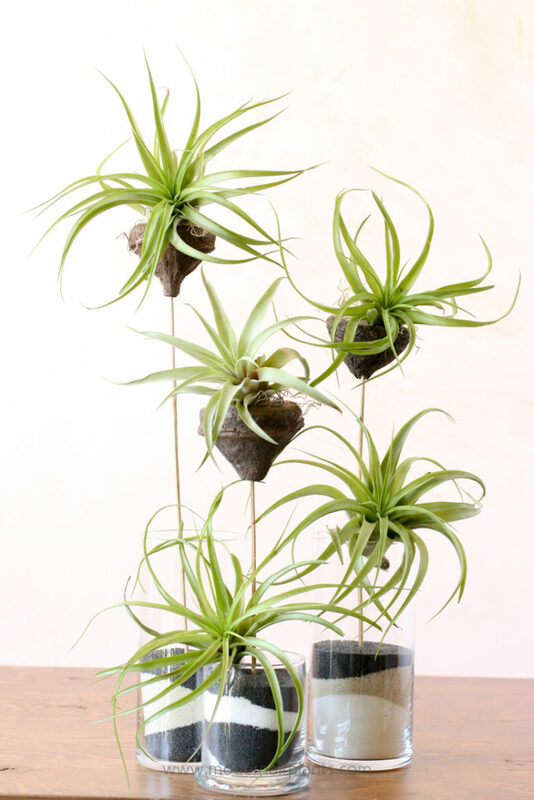 These cute pods are not attached to a stem, so no wire-cutters are needed. These pods work well for table-top display. My velvet pods came in a plastic bag with about a dozen or so pods. Select pods with a wide opening. Like the other pod designs, add a little Spanish moss. 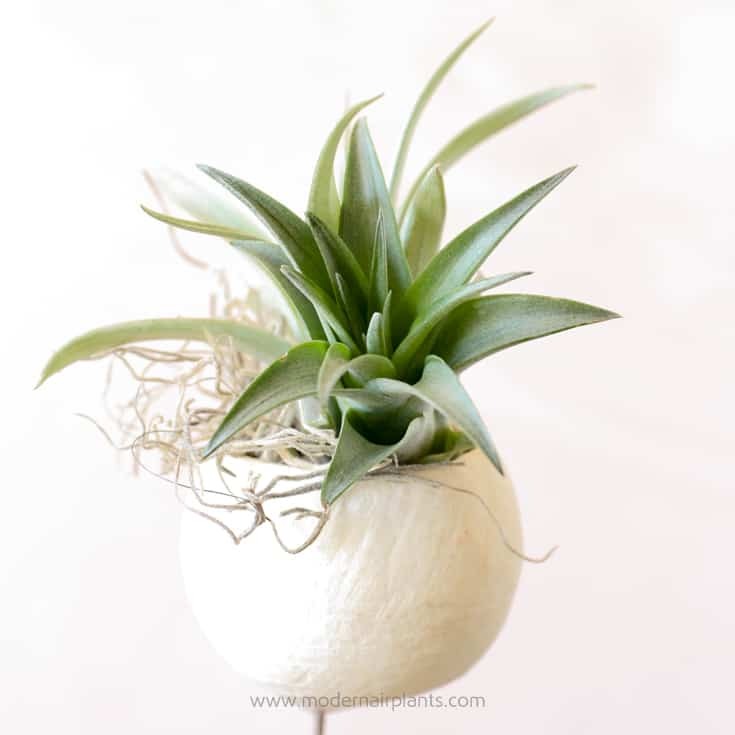 Set the air plant in the pod. 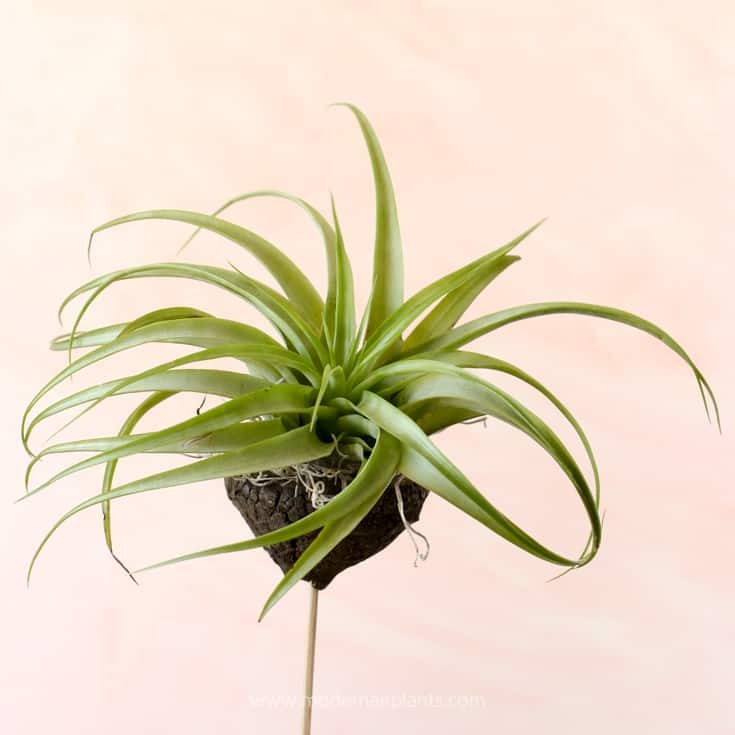 Pictured here is a Tillandsia recurvifolia purple hybrid. Add a little color with a dried purple amaranth. 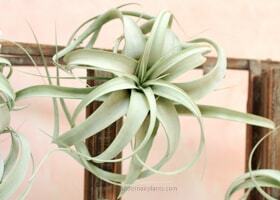 That’s all there is to it: pick a pod, choose your air plants. 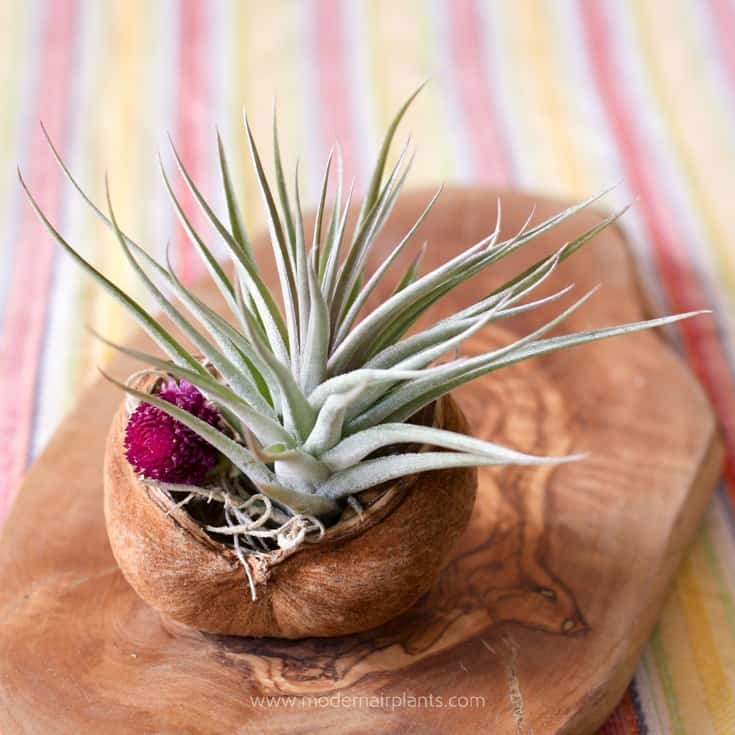 Stick a little Spanish moss inside the pod, add an air plant and finish it off with a dried flower.